Russian author; born in Minsk 1778; died in St. Petersburg. He was a prominent propagandist of the Haskalah movement among the Russian Jews in the first half of the nineteenth century, for which task his intimate knowledge of the Hebrew, Russian, and Polish languages made him especially fit. He took an active part in aiding the Russian government to reform internal affairs which affected the Jews; he was employed for many years by the government as a translator from Hebrew into Russian and Polish, and for six years he officiated as burgomaster (mayor) of his native town. 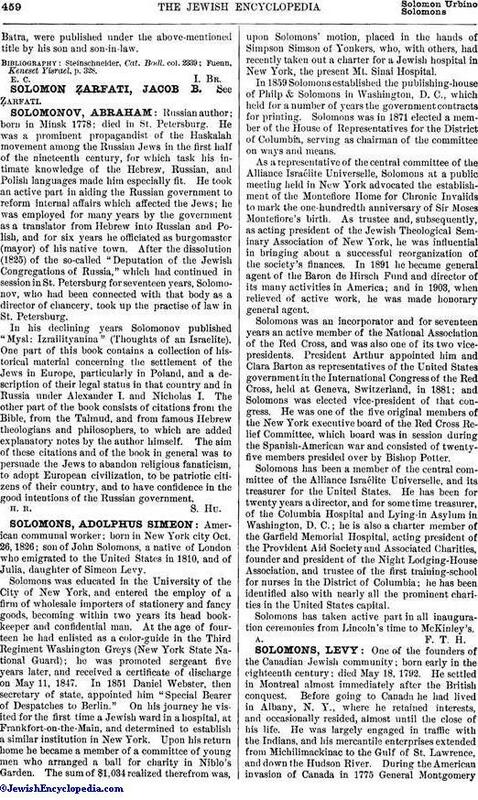 After the dissolution (1825) of the so-called "Deputation of the Jewish Congregations of Russia," which had continued in session in St. Petersburg for seventeen years, Solomonov, who had been connected with that body as a director of chancery, took up the practise of law in St. Petersburg. In his declining years Solomonov published "Mysl: Izrailityanina" (Thoughts of an Israelite). One part of this book contains a collection of historical material concerning the settlement of the Jews in Europe, particularly in Poland, and a description of their legal status in that country and in Russia under Alexander I. and Nicholas I. The other part of the book consists of citations from the Bible, from the Talmud, and from famous Hebrew theologians and philosophers, to which are added explanatory notes by the author himself. The aim of these citations and of the book in general was to persuade the Jews to abandon religious fanaticism, to adopt European civilization, to be patriotic citizens of their country, and to have confidence in the good intentions of the Russian government.